Just came home from kickboxing and was really hungry. I felt like I could eat a cow… hmm okay, maybe a chicken. Or maybe a good burger! There’s a McDonald’s near my place but heh I really don’t fancy their burgers. Then I remembered there’s a pasar malam nearby and they sell Ramly burgers. Just from me to you, I used to hate Ramly burgers because they looked so oily and grotesque on the grill. None of them looked edible. Apparently I haven’t been looking in the right places. One might think all Ramly burger stalls are the same but I beg to differ. There’s a huge difference. 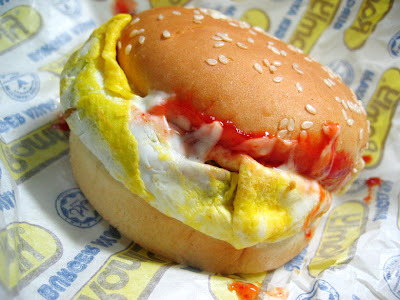 And I must say that I was glad I read ieatishootipost’s post on Ranor’s Ramly Burgers in the Makansutra Forum. He tried the beef version but I stuck with the chicken. Told you I could eat an entire chicken; hmmm okay maybe just a chicken patty, sandwiched between fried egg, cheese, chilli sauce and fluffy sesame coated buns. At only $2.50, I think it’s a steal. It can’t get any better. Ranor’s Ramly Burgers are comparable to those sold in Malaysia. I’m not kidding! The patty is not drenched in oil and neither is it too hard. 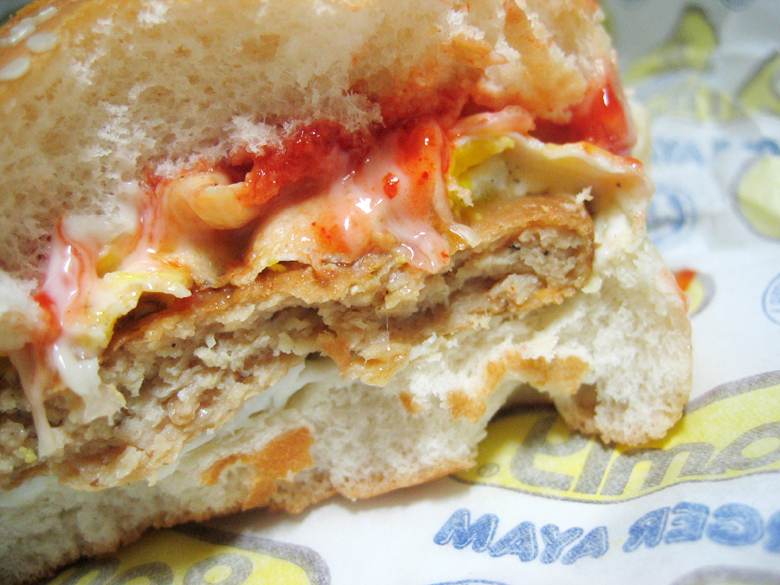 Everything is done just right – the egg, the chilli sauce (ooo-la-la… spicy and feisty! ), patty and good thick buns. This burger made my day! I couldn’t stop raving about it after. My mum went out to buy one for herself after hearing me sing praises about it. I am still surprised actually. Could I have ever imagined a Ramly burger in Singapore tasting so good? I think not. You have got to try this burger. It’s yummilious. But thing is, Ranor Ramly Burgers are not located at a fixed location. They go where pasar malams go. So it depends. If you’re lucky, you might get them in your neighbourhood. Oh and one more thing – you can spot the difference in packaging. 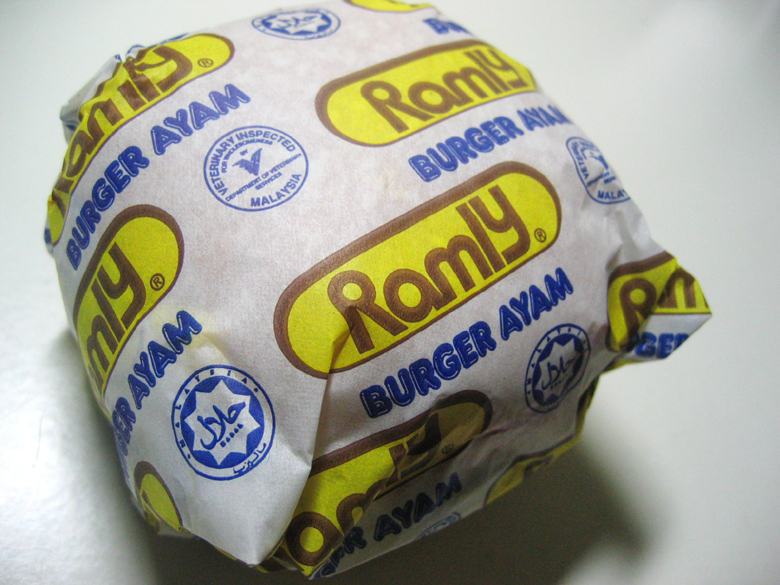 Other Ramly Burgers pack theirs in styrofoam box but Ranor wraps theirs in the authentic Ramly paper with its logo on. 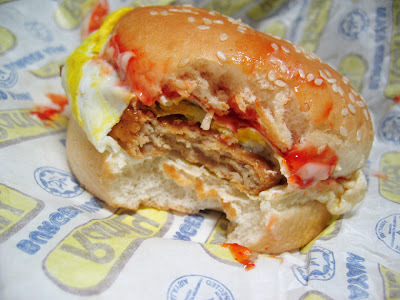 Sometimes, I do think that Ramli Burger is nicer than McD burgers. 😛 And it’s cheaper! the best Ive tasted were at Hitam~ hahaha but since I dun take coach to Malacca anymore .. I havent get to eat those yummy burgers again! Hooray!! Found myself a Ranor Ramly Burger friend to rave about Ramly Burgers! would you believe I have not sunk my teeth into a ramly burger yet!